Explore our Dominican Republic surf holiday destinations. Considering its location next to wave-drenched Puerto Rico, the Dominican Republic surf story should have a deeper history and established surf culture, yet it has managed to stay more of an underground surf destination until recently. Now the island, more notably the north coast, has become a hot bed for talented local surfers and traveling surfers from the US, nearby Puerto Rico, Argentina, Chile and Europe. The level of surfing in the Dominican Republic has sky rocketed! The locals are really beginning to find their feet in the surf in the Dominican Republic. Expect the best surfers to be the local groms, even if they are surfing on banged up hand-me-downs from visiting surfers! 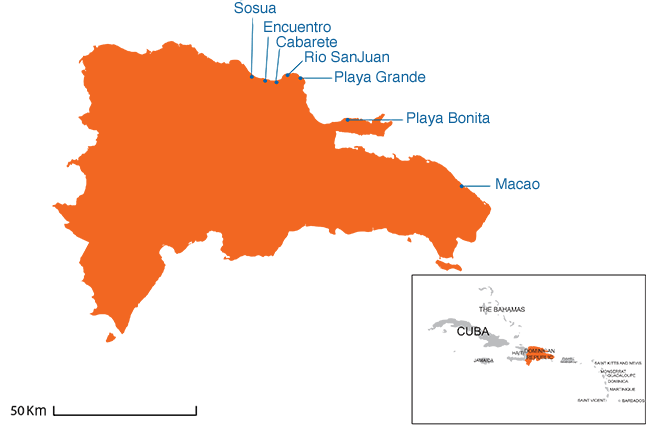 The Dominican Republic is the second largest country in the Caribbean, occupying the eastern side of the island of Hispaniola. The Western side is the country of Haiti. To the east is the Mona Passage, a strait which separates it from Puerto Rico. The Dominican Republic’s north shore is known as the 'Amber Coast' and receives consistent Atlantic swells between November and March, as well as north swells that come from low pressure systems off Florida. The southern part of the island receives swells generated in the Caribbean Sea, whilst fickle most of the year, some fantastic waves can come alive during a cyclonic swell which makes for some of the best Dominican Republic surf spots. Prevailing winds from the E and NE blow all year round and become strong around late morning, before tapering off again late afternoon. From November to February these winds can be very strong making it a popular kite surfing destination, and when offshore becomes an epic place for a Dominican Republic surf holiday. Sosua main beach offers left hand walls over a sand and rock bottom whilst just south of here is El Tablon, a right hand wave that offers short yet powerful rides making the area a nice option for a Dominican Republic surf holiday. For those wanting to learn to surf, Dominican Republic has some great options. The water around Sosua is crystal clear and offers the perfect opportunity to put on a snorkel and mask and dive under the water, as well as some great left and right peaks. The town has a fantastic history and is evident in the architecture found. The Dominican Republic was a haven for Jewish refuges during the war and you can find many historic sites and synagogues whilst you amble around the town. There is a great nightlife scene in Sosua thanks in part to the community of ex-pats as well as friendly and inviting locals who will be more than happy to show you the best spots for a cold drink and some lively tunes while staying at a Dominican Republic surf resort. Cabarete is a lively town with restaurants dishing up local cuisine with an emphasis on fresh seafood and energetic bars & night spots blaring Caribbean and American tunes. Its a good base for a Dominican Republic surf camp holiday. Encuentro is the most consistent break in the area, if not the whole north coast and picks up any hint of swell from any direction that produces some of the best beginner surfing in Dominican Republic. There are a variety of peaks which are great for beginners, such as ‘Bobos’ that has waves that offer a smooth take off before walling up, allowing you plenty of time to set your line and feel steady. Cabarete is where you will find the best Dominican Republic beginner surf. When the waves decide to drop in size or the opposite, or alternatively you’re just too tired to head back out for a session and fancy doing something different, we suggest a visit to the beautiful island of Cayo Lavantado for a slice of paradise. For adrenaline seekers, head to Lake Dudu for a fun packed day of natural slides, tarzan swings and 10m cliff jumps for the truly adventurous. Stay in one of our Dominican Republic surf camps and use it as a base to surf and explore. Rio San Juan is a quieter town that is known for its unrivalled beauty due to its location on a mangrove lagoon. This is the perfect place to spend days lounging on pristine white sands in between hitting the Dominican Republic surf. The area also offers you outstanding snorkelling and diving experiences that can only be found on our surf tours Dominican Republic. Rio San Juan is also a great place to enjoy delicious coffee and sweet treats, thanks in part to the business-owning, French expat community. The main break of Rio San Juan offers up right hand waves that are great for beginners looking to brush up on their technique and progress to the next level. Those looking to test themselves should head to Playa Grande which packs a bit more punch and can offer much longer rides when the sand banks line up providing some of the best intermediate surf Dominican Republic offers. One of the Dominican Republics main tourist destinations. The area is surrounded by beaches, not all of them get surf, but 20km away is the picturesque Playa del Macao. The beach is perfect for beginners and a great place to relax in the beach bar after a day in the water. To get from Puerto Plata or Santiago airport to Cabarete is an easy taxi ride, costing from $35(USD) from Puerto Plata Airport to around $80 (USD) from Santiago Airport. There are also reliable bus service options from these airports to the main towns, ideal for those looking to learn to surf Dominican Republic style! Many flights from Europe fly into Punta Cana Airport which is a 6 hour drive from the surf spots on the north coast, you can get connecting flights to Puerto Plata and Santiago to cut out the arduous journey by road and get you to the incredible Dominican Republic surf spots as quickly as possible. The Dominican Republic has a semi-tropical climate, with warm temperatures all year round that are kept comfortable with the prevailing easterly winds. Dominican Republic surf holidays are some of the most comfortable conditions you can find yourself in! The cooler season is considered to be between November and March, whilst the temperatures don’t really change during this time, the humidity lowers and you can expect a few days of rain each month, but this doesn’t affect the Dominican Republic surf season. Along the coast you can expect balmy temperatures from between 28°C -31°C which can reach highs of 35°C during the summer months, with night time temperatures rarely dropping below 21°C. The highlands are a bit cooler, so if you are expecting to go on some mountainous treks, pack a long sleeve top and thin trousers. The water temperature is paradise! It reaches highs of 29°C and can drop down to 25°C during January, a 1.5mm wetsuit top will be the perfect barrier during this “colder” time of year. The rest of the year you can wear board shorts, just don’t forget to slap on plenty of sun block, you don’t want to get sun burnt in the Dominican Republic surf.